While the oil industry tightens its grip on the White House, the rest of the world is looking in the other direction: towards renewables. Speaking at the opening of the One Planet Summit in Paris, United Nations Secretary-General António Guterres called on governments, civil society, the private sector and finance partners to take greater action in tackling global climate change. The Summit opened on 12 December, the 2nd anniversary of the historic Paris Agreement, in which the 195 Parties to the UN Framework Convention on Climate Change (UNFCCC) pledged to curb emissions, strengthen resilience and joined to take common climate action. Donald Trump controversially pulled out of the agreement earlier this year. French President Emmanuel Macron welcomed world leaders along with World Bank President Jim Young Kim (left) and UN Secretary General Antonio Guterres (right). Picture: Getty Images. If money talks, then Mr. Guterres made his point: calling for financing – by its nature forward-looking – to be used for future of people and the planet, as well as for profit. He pointed out that fossil fuels remain heavily subsidised. “[This means] we are investing in our own doom,” he said, before applauding the efforts by individual cities and territories around the world, as well as communities and private businesses, who are already taking substantial action on climate change. These include some major oil and gas companies, through projects like the Oil and Gas Climate Initiative. Earlier this year, Norges Bank, the Norwegian central bank Norges Bank, which runs the country’s sovereign wealth fund, told its government earlier this year it should dump its shares in oil and gas companies. At $1tn, the fund is the world’s biggest; the advice, irrespective of climate change, was aimed at reducing the vulnerability of government wealth to permanent drops in oil and gas prices. 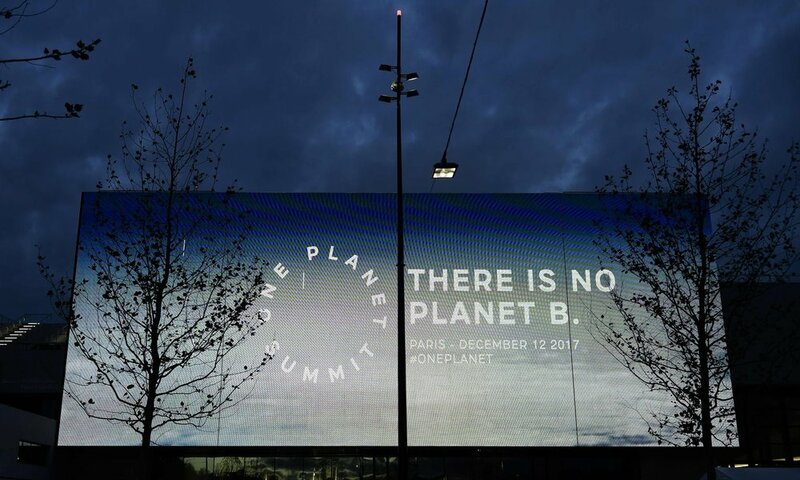 A screen reading ‘There is no planet B,’ outside the One Planet Summit in Paris. Photograph: Philippe Lopez/AFP/Getty Images. The UN chief stressed that it is not funds but trust - between developed and developing countries - that is lacking. Developing nations say the rich are lagging with a commitment dating back to 2009 to provide $100 billion a year by 2020 - from public and private sources alike - to help them switch from fossil fuels to greener energy sources and adapt to the effects of climate change. “We need to build trust and reduce risk, make the best use of available resources, and find innovative ways of financing, such as green bonds whose viability and success are already realities,” the Secretary-General said. One of the hundreds of islands making up the Guna Yala archipelago in the Caribbean Sea off the coast of Panama. Rising sea levels attributed to climate change are forcing the islands’ indigenous communities to make plans for their evacuation to mainland Panama. Photo: El País. At the same time, in a historic announcement, Jim Yong Kim, the President of the World Bank Group, announced that the Group will no longer finance upstream oil and gas after 2019 and that it would be using finance instead for climate change impact mitigation and resilience, investing up to $325 million in the Green Cornerstone Bond Fund, a partnership with the asset management company, Amundi, to create the largest ever green-bond fund dedicated to emerging markets. “This is a $2 billion initiative aiming to deepen local capital markets, and expand and unlock private funding for climate-related projects. The fund is already subscribed at over $1 billion,” read the announcement. Wu’s words illustrates the limits to climate change solutions that are couched in the language of profit and growth. The window for change is closing; acting in global concert is the only solution. The world calls on the richest countries, people and organisations to take the actions that are needed to save us all.